Over the last 12 days a team of scientists, engineers, technicians, submersible pilots, and ship’s crew sailed into the Gulf of Mexico and took the United States’ newest research submersible, the human-occupied vehicle (HOV) Alvin, on its first scientific dives. Though the sub had been through a number of rigorous Navy certification dives to ensure that it can safely transport its occupants to and from the cold, dark deep, Alvin’s scientific equipment had yet to be thoroughly tested. Equipped with the latest in deep-sea cameras and lighting, as well as new viewports that are arguably the “best in class,” Alvin promised to be an exceptional vehicle for research, transporting its occupants into a realm we rarely get to visit. Moreover, with an onboard computer network that moves data among the scientific sensors at gigabits per second, it stood to reason that Alvin would provide its users with a fantastic opportunity to deploy advanced sensors and other tools that will bring us closer to understanding the deep sea. 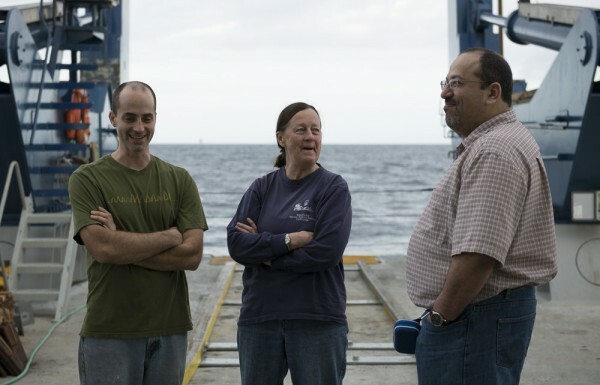 All these notions, however, were simply conjecture until Alvin returned from her first scientific dive on March 15. On this cool breezy day, we shipboard scientists stood anxiously on deck, awaiting the report from Alvin’s complement. All those who were on board that first dive were thrilled to see the sub perform so well. All the major, critical components functioned as well as or better than expected. Concerns about how well the sub would handle, and how long it could stay on the bottom, vanished. After the second dive, our confidence in the sub’s major systems grew, and we quickly turned our attention to the onboard scientific systems. During the subsequent dives, we worked with the Alvin Operations Group to correct a number of minor, but scientifically critical, issues. LED lights were added to augment the nearly dozen or so lights already on the sub. Some of the lights were repositioned to enhance video quality. The sub’s serial communication systems, used to talk to scientific instruments, would drop out after long stretches of data acquisition. In response, the Alvin team is adding more shielding to the lines, which will likely remedy this issue. During these dives, observers also found that the high-definition video recorders, which give the scientist an unprecedented ability to record from the five HD cameras on board the sub, would sometimes lose video. This is a major concern, but thanks to the diligence and tireless efforts of two WHOI employees, Jonathan Howland and Scott McCue, we appear to be closing in on a solution (indeed, the problem may have been solved by the time you read this). There were other bugs as well, most of them minor, but the Alvin team has resolved the majority of these issues, ensuring that they will not be a problem for upcoming scientists. Despite our collective best efforts to identify and resolve issues as they arose, we had to end our dive series early because of the failure of one small fan that circulates air inside the sub. This little fan is designed to last a decade or so, plus or minus a few years. Thus, it’s not easy to predict if and when it will stop working. Because the Alvin has a spare on board, which has now been installed as the primary fan, the sub and its occupants were never really in harm’s way. Regardless, safety regulations dictate that the sub stop diving until we can replace the spare that we’ve now used as the primary fan. While we scientists never like to lose dives, I for one am grateful that it happened now instead of during a forthcoming research cruise. This has allowed the Alvin team and their shoreside support group to work on getting a replacement in place before the upcoming science mission. 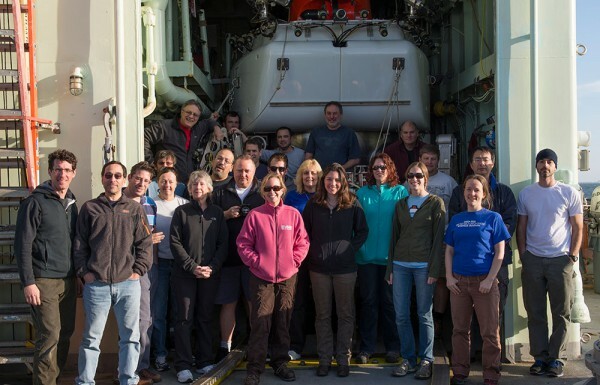 This incident underscores the value of having a “science verification cruise.” I am confident that our efforts have been of great value to the Alvin Group as they shake out the bugs, and to the upcoming science groups who finally use Alvin as it should be used: to explore and study the deep sea in a manner previously unattainable. As this expedition comes to an end, I am reminded of my first Alvin dive in 1994. My job as the junior scientist on the dive was to change the videotapes on the recording decks and to record key information about the dive on an audio cassette recorder. Now, we’re discussing how many terabytes of data we’re collecting on each dive and which HD video formats are most appropriate. Times change and technologies advance, and so it goes for Alvin as well. Naturally, today’s Alvin will one day be dated, but what the Alvin program represents is timeless: humanity’s commitment to build vehicles and tools to take us on missions of discovery.